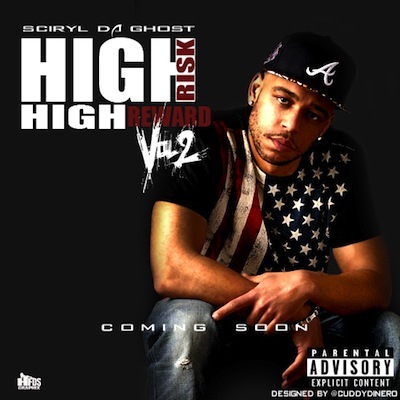 As the philosopher Plutarch said, “The whole life of a man is but a point in time; let us enjoy it.” It seems Chicago rapper Sciryl Da Ghost has taken this wisdom to heart in abundance with his mixtape titled High Risk High Reward II (out on iTunes and via his website). This, of course, is the follow up to his 2014 mix tape, High Risk High Reward I.
There’s also a music video to accompany “I Kno” ( https://dunndealpr.com/sciryl-da-ghost-i-kno/ ) . Even though it is, on the surface, in the style of a slasher/horror flick, the video subtly touches on many other hot button social issues. The themes of egalitarianism, protecting the physical reminders of our shared history and the decay of personal connections in an increasingly electronic society are all readily apparent. All of this is presented in a delightful jump scare and cringe package that carefully balances the story line and Sciryl’s personal appearance. Although some of the lyrics are brutal they are clever and universally applicable. Who of us hasn’t been at a “ramen for every meal” point in life? Sciryl has been and doesn’t fail to be grateful that he has worked his way to something better. Sciryl delivers his catchy rhymes in a deliciously deep voice that he uses well to accentuate his message. One song that really stands out is “Just Got Real”, a track with smooth jazzy (bluesy?) horns tucked away behind a head nodding beat. While this might not be everyone’s cup of tea, it is certainly worth a listen (or seven, in my case). Also, it would be really interesting to see what he can do if he was to expand from his niche following and create for a wider audience. Sciryl is also on Twitter and can be followed here.